4.5! I've been hearing this author mentioned a lot lately, and now I know why. This historical romance is easily on par with some of the best authors of this genre - Balogh, Quinn, Kleypas...etc. I think the one thing I enjoyed most about this story is how I got to see the romance evolve from a cold and simple business association to a deeply warm and passionate friendship all the way to a heart stopping love. Both characters evolve emotionally as well, when they realize the circumstances of which they created may not have the intended outcome. 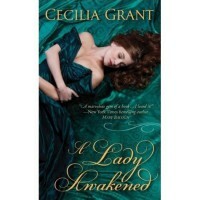 A Lady Awakened was a great tale that kept me fully engaged, with a strong storyline and two well developed, interesting characters. I will definitely be reading the next in this series soon.